Port Isabel Police has a new tool that will help officers monitor traffic and respond to accidents. That’s the word from Chief of Police Robert Lopez, who unveiled two police motorcycle units Wednesday. 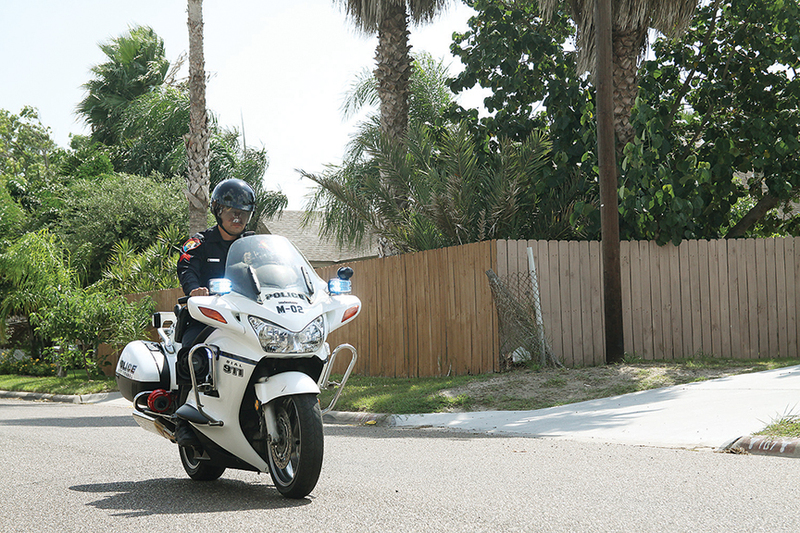 The bikes, Honda Goldwing 1300s, were purchased from the City of Brownsville and the Brownsville Police Department. They’re 2009-2010 model year bikes and came outfitted with everything a patrol officer needs, including emergency lights, sirens and panniers. “I’m very appreciative of Chief Rodriguez from Brownsville Police and also Sgt. De la Rosa who was very instrumental in helping us get these bikes,” Lopez said. PIPD was able to purchase the motorcycles via asset forfeiture funds, Lopez said. It took approximately $12,000 to pay for the two bikes, as well as safety gear and uniforms for the officers who will be using them, Lopez said. Three officers will have that honor: Sgt. Manuel Garza, and Officers Mike Rodriguez and René Camacho, the chief said. All three have become certified in motorcycle patrol.